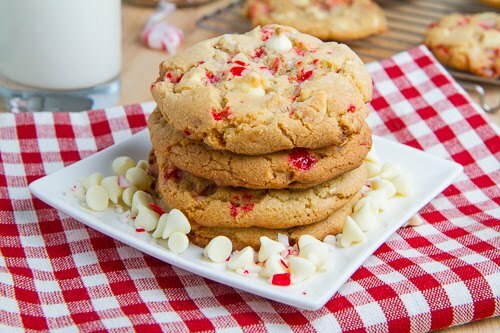 White chocolate chip cookies with festive peppermint candy. In addition to baking my favourite holiday cookies every year I like to try some new ones and top on my list for this year was some peppermint white chocolate chip cookies. 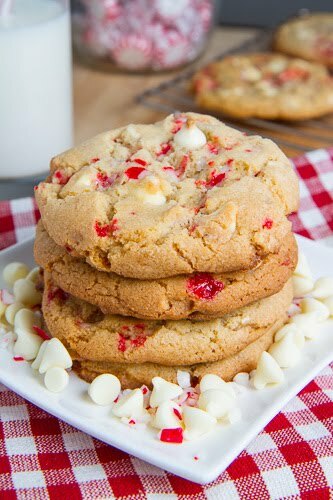 White chocolate chunk and macadamia nut cookies have to be one of my all time favourite cookies and I was thinking that it would be great to take a festive spin on them and use peppermint instead of the macadamia nuts. For the recipe I went with my usual white chocolate chunk and macadamia nut cookie recipe and replaced the macadamia nuts with crush peppermint candy canes or in this case peppermint candies. These chocolate chip cookies turn out nice and crisp on the edges but oh so soft and melt in your mouth on the inside! The crushed peppermint candy added and amazing peppermint flavour along with a rather pleasant crunch. 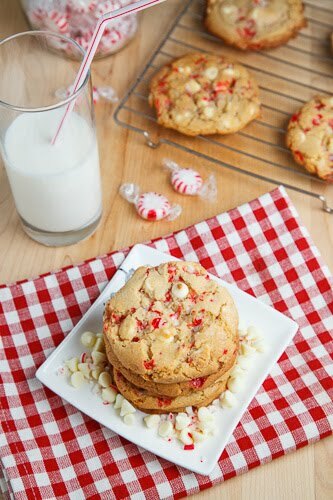 I will definitely be adding these peppermint white chocolate chip cookies to my regular holiday rotation! You will have to excuse me while I go a place another batch into the oven. These peppermint white chocolate chip cookies will disappear fast! Mix the butter and sugars in a bowl. Mix in the chocolate and the peppermint candy cane. Chill the dough in the fridge for 30-60 minutes before placing it onto a parchment paper lined cookie sheet one table spoon at a time rolled up into balls. Bake in a 350F/180C preheated oven until just lightly golden brown around the edges, about 8-10 minutes. Note: Due to popular demand, I have updated the recipe to produce a thicker version of the cookie and I have added tips to ensure that the cookies turn out right every time. These look very festive and awesome! Great idea! Yum! These look so festive, and the red from the peppermint adds an extra fun pop of color! peppermint just means Christmas, yum! This looks so tasty! I never would have thought to bake candy cane with cookies. Kevin, I was looking for this recipe just last week! I swear you are my soul mate! I had so much trouble finding one that actually looked good and I eventually came up with something very similar, except instead of candycanes I made a peppermint glaze to drizzle on top. I <3 white chocolate and pepermint! Keep up the good work! I love the white chocolate peppermint combo! Sounds perfect in cookie form! Ahh they're so pretty! And delicious too, I'm sure. I guess it's time for me to finally use those peppermint candy sticks I have left over from last Christmas …. These look fabulous! Am going to try this recipe tonight! these would be some delicious christmas gifts!! I made these cookies and they taste great, but they spread and fell flat. Yours look nice and fluffy. Do you think I need to increase the baking soda? These sound and look delicious! Any tricks for crushing the candy canes? (Every time I do I get dust and chunks). This is yummy! I made this recipe and pressed it into an oversize (10 or 11 inch) pie plate for a giant cookie. This dough sticks a lot; I would highly suggest using parchment paper. I made the giant cookie for my hub's b-day, along with my homemade White Choc Peppermint Ice Cream- they were delish together. Your cookies turned out so beautiful! I tried to duplicate these cookies as a Christmas gift, and while they tasted amazing, they got stuck to the tray and crumbled when I tried to get them off. Any suggestions? i made these today and they flattened out 🙁 yummy but not so pretty, any ideas as to why? Hi Kevin, I loved the idea of this recipe so much, I made the dough tonight to cook tomorrow. My dough seems kind of dry, a bit more crumbly than I am used to. Is that to be expected? Any suggestions for me? Help, I made these and they taste wonderful but they turned out flat, any suggestions? Rona: White chocolate and cranberries is another great combo! Laura: I place the candy canes i a heavy freezer bag and then crush them by leaning on them with the bottom of a bowl. What a Dish! & Hannah: Parchment paper or a silicon baking sheet will help with sticking. What a Dish! I like the sound of serving it as a giant cookie with peppermint ice cream! Jen: This recipe uses a bit more flour than normal in order to prevent the cookies from flattening but the dough should come together without crumbling. Great recipe for Christmas cookies. I like the printable recipe it’s very useful for me. I made these and they are totally flat. Maybe too much butter for only 1.25 c. flour? Can recipe be doubles? I like to make big batches, not just 12 cookies, when I bake! What size are yours? Thanks! MarbellaSD: This recipe easily doubles. The same thing that happened to Amanda just happened to me. There is something wrong with this recipe. I had to scrape the whole batch into the trash. Scrape because I couldn't pick the cookies up they were so flat and spread out. Epic fail!!! I just made these today and they were very good with these changes: I used 1 1/2 cups flour (half all-purpose and half bread flour – the bread flour makes for a chewier cookie) and increased the baking soda to 1 tsp. I also refrigerated the dough for about an hour before I baked the cookies. I used a large cookie scoop (about 3-4 Tbsp.) and baked the cookies on parchment paper-lined cookie sheets. The cookies came out beautifully and tasted great – crisp on the outside and soft and chewy inside. Thanks for the good recipe! I did all of the suggestions…no overmixing, extra flour, etc. I was SO disappointed when they went flat. I've never had a cookie do that before. I wanted to give them as a present, but had to quickly whip up something else. Fortunately, hubby and kids don't care what they look like. Although the original version of this recipe turned out perfectly for me for the 4 batches that I have made so ar this year, it is clear that it was not working for a lot of you. My testing of the new version of the recipe creates a thicker cookie than the ones in the photos above and it is also nice and crispy on the outside and soft and chewy on the inside. I have also added a few tips to the recipe to help ensure that the cookie turns out perfectly every time. Enjoy! Hey Kevin, made a double batch of these today. Added an extra quarter cup of flour per batch. Perfect and lovely for Christmas! I accidentally bought candy canes with green and red stripes but the extra color didn't detract too much. People who have had these fall flat: You could be using out of date baking soda. Even if it is out of date by as little as a week, it can still vastly affect the outome of whatever it is that you are baking. I'm the same person as anonymous, but anyways… I made these cookies a bit ago and have a few more observations. Those who said their cookies went flat; were you dropping them by spoonful on the cookie sheet or were you following the directions to the letter and rolling the batter into balls first? I rolled mine into balls and didn't have an issue, they actually turned out more-or-less like the photos above. Just something else to consider if your baking soda was still okay and not out of date. That said, I used a full cup of crushed candy canes (doubled the recipe) and the cookie isn't all that pepperminty, which is totally fine for me because I don't like strong peppermint flavors. (I was mainly making this for my husband because he *loves* peppermint.) Last but not least, the batch size: I doubled the recipe, because according to the directions it says the recipe makes a dozen. It doesn't. I doubled the recipe because I wanted more than a dozen cookies out of it… I ended up with almost 5 full dozen; and they are not small cookies! Not exactly a bad thing. 😉 Overall, a nice recipe! I made these cookies today and had the same problem with the first two sheets I baked-fell flat. I stuck my dough back in the fridge for another hour as I had only chilled the first time for 30 minutes. I also added about 2 TBS of extra flour to remaining dough and the rest came out much better, still a little thin but not bad. The flavor of these cookies is great so I will definitely make again but I think next time I will try adding 1/4 c. extra flour and chilling for at least an hour to see if that helps. I had leftover batter from my original attempt at these cookies. I added MORE flour and more baking soda, and a dash of vanilla extract since the batter had dried out, and they turned out just fine. Thanks! Tried these today. Make sure you roll them into balls and DO NOT flatten them at all. They will look like pretty normal cookies then. The only problem is the candy melts a little faster than the cookie cooks! So just a keep an eye on them. It also might make a fluffier cookie by using half bread flour and half regular flour! I gave these as a gift. They weren't pretty, but everyone said they tasted good. My cookies turned out fantastic! The only thing I'm puzzled by is that the peppermints melted and oozed out the sides, which made for weirdly crispy bottoms and strange edges. Next time I might try smaller peppermint pieces or sprinkling them on top instead. I will say, though, that overall they were the most perfect cookie I've ever baked – they definitely didn't fall flat for me. Thanks! So this might sound weird, but I found this recipe through a linky party. But it wasn't linked to your blog, it was directed here. It looks like the stole your picture and recipe. The thing is, their first link was to another recipe they stole. So I went back to check if the link was taken down, and it wasn't, it was just redirected and I checked the recipe and found yours. Anyway I just thought you should know. suzy homemaker : Thanks for letting me know about this! Now to try to get it taken down. I had leftover Andes Peppermint Crunch baking chips from Christmas, stumbled across this recipe. YUM! YUM! YUM!!!! I should have made them when I had people to share them with because I will surely eat them ALL!! Now off to exercise. HA! I made these with Unbleached all-purpose flour. They were fantastic! I made 1 Tbsp balls as directed (make sure the balls are compressed tightly). Baked them on a silicone baking mat and got 24 perfect cookies. These look fantastic! However I am not a huge fan of peppermint…but love cinnamon … could you substitute the candy canes for red hots? Anonymous: Red hots would work. Hi Kevin! These cookies look divine! I was wondering if anyone has made these cookies using gluten free flour? Healinglove: I have not tried it but a gluten free blend should work. If you do make them gluten-free I would love to hear the results! I found that with the refrigerated dough, you end up having to bake the cookies longer. I initially baked mine for 10 minutes, but found them to be too doughy inside and quite flat. I popped them back in for an additional 4 minutes. In those 4 minutes they rose up a bit more and the bottoms were a nice golden color. The peppermint pieces near the tops of the cookies did turn a caramel color within 10 minutes, which made me think that the cookies were done, but they weren't, the bottoms were still white. Mine did not come out as perfectly shaped. Whenever there was a piece of peppermint near an edge, that edge would blow out. Also, I misread the recipe initially and used baking powder instead of soda. Luckily I was able to fix the batch since I know that baking soda is about 3x stronger. I wonder if people with the flat cookies are making that same mistake? These look amazing! So festive and I bet the mint is very refreshing! Mine came out flat too. once I raised the temp to 375 they came out a little better. I just pulled the first batch of these out of the oven and they are delicious! I was able to find crushed candy cane in a bag at Kroger so I didn't have to do that and I'm impatient so I skipped chilling the dough and they still came out well. i made these cookies tonight. and though they were super delicious.. they were awfully mushy and crumbly. I made the second batch with a bit more flour hoping that would help. it only helped a bit. and then they didn't taste as good as the first batch. any suggestions? I made them today, and they really flattened out. Refrigerated them for about 1 hr. Maybe I over-mixed. But the recipe says it makes 12 servings. If you use a tablespoon to make each cookie like it says, you get a lot more than 12 cookies. I made these cookies and they came out flat as a pancake. I don't know what I did wrong. Taste good but will not take them out for parties etc. I am going to make the chocolate and maraschino cherry shortbreads and instead of the cherries will substitute the peppermint candies. Just made these today, and they definitely don't look as good as the ones in your photo 🙁 How do you get the crackly top effect? Mines have a smooth top. I made these yesterday and they all ended up In the trash. They were real funny and flare I had to throw them away because they didn’t look that good to share I took a picture of them. You said you revised it to thicker cookies but they weren’t thicker ones.